The Reserve Bank of India (RBI) is the highest monetary authority in the country. RBI prints the currency notes of all denomination from Rs. 2 to 2000; except one rupee note (printed by the Ministry of Finance). Latest data released by RBI on March 3, confirms that currency in the hand of public stood at Rs 17.06 lakh crore as against Rs 17.01 lakh crore before the monetisation. Another estimation done by the RBI says that the numbers of the counterfeit notes in the FY 2017 have increased by 20% and the number reached to 7.62 lacs. The maximum numbers of fake notes were in the denomination of 500 and 2000. To aware the general public we are publishing some security features of the currency notes so that counterfeit notes can be detected by the general public. The security thread appears to the left of the Mahatma's portrait. Security thread has a plain, non-readable fully embedded security thread. But since October 2000, the Rs.2000 notes contain a readable, windowed security thread alternately visible on the obverse with the inscriptions ‘Bharat’ (in Hindi), ‘2000’ and ‘RBI’. All the currency notes have security thread. 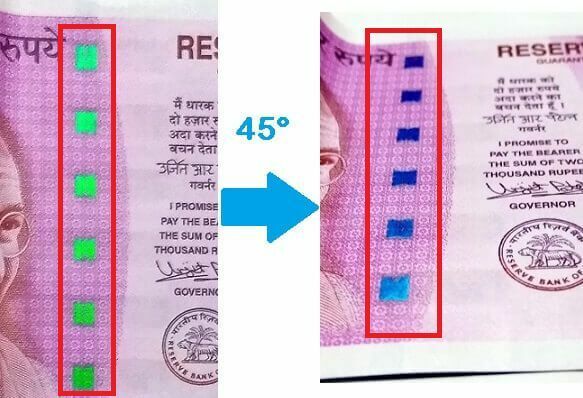 When notes held against the light, the security thread on Rs.2000, Rs.500 and Rs.100 can be seen as one continuous line. This feature appears between the vertical band and Mahatma Gandhi portrait. It contains the word ‘RBI’ in Rs.5 and Rs.10. The notes of Rs.20 and above also contain the denominational value of the notes in micro-letters. This feature can be seen well with the help of a magnifying glass. 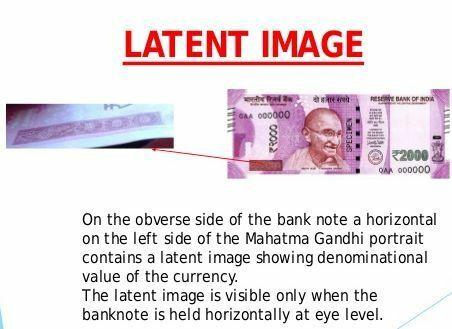 On the obverse side of Rs.2000, Rs.500, Rs.100, Rs.50 and Rs.20 notes, a vertical band on the right side of the Mahatma Gandhi’s portrait contains a latent image showing the respective denominational value in numeral. The latent image is visible only when the note is held horizontally at eye level. To help the visually impaired a special feature in intaglio has been introduced on the left of the watermark window on all notes. This feature is in different shapes for various denominations i.e. Rs. 20 have in Vertical Rectangle, Rs.50 in Square, Rs.100 in Triangle and Rs. 500 in Circle. This feature is added in the bank notes for the convenience of the blind peoples. 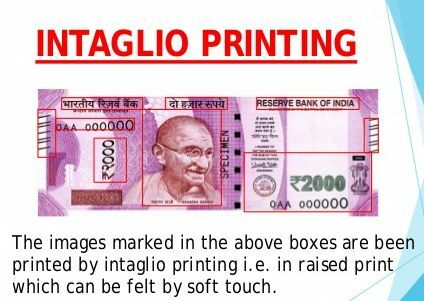 The Ashoka Pillar Emblem on the left, portrait of Mahatma Gandhi, the Reserve Bank seal, guarantee and promise clause, RBI Governor’s signature are printed in intaglio. 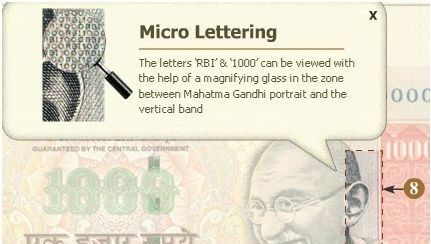 In the Indian currency notes of denominations Rs.20, Rs.50, Rs.100, Rs.500 and Rs.2000 have used this style of printing. This is a new security feature incorporated in the Rs.1000 and Rs.500 notes since November 2000. The numeral digit 2000 and 500 on the obverse of Rs.2000 and Rs.500 notes respectively is printed in optically variable ink viz., a colour-changing ink. The colour of the numeral 2000/500 appears green when the note is held flat but would change to blue when the note is held at an angle. This feature will show up number when the note is held against light. The small floral design printed both on the front and back of the note in the middle of the vertical band next to the Watermark has an accurate back to back registration. Number panels of the notes are printed in fluorescent ink. 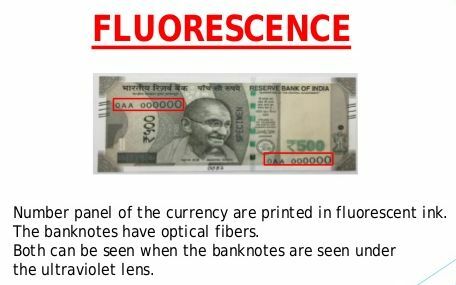 The notes also have optical fibres. Both can be seen when the notes are in front of ultra-violet lamp. So these were some important security features on the Indian currency notes. The Reserve Bank of India and Ministry of Finance are trying hard to make sure that the Indian notes could not be counterfeited and the government is success in its efforts up to some extent but these security features could not prevent the tradition of printing fake notes in the country. Next Story What types of toxins are present in Tap water?